It’s four a.m. and you can’t sleep. You can’t breathe. All motor skills are useless except the ones necessary to use tissue. You can, however, manage to sneeze, snort, hack, cough and sniffle. A lot. Even your dog is beginning to dislike you due to the rude and loud noises vibrating from your body. On your death bed? Probably not, although the culprit, the common cold, can certainly make one think their days are numbered. Well, take two jalapeños and call me in the morning. 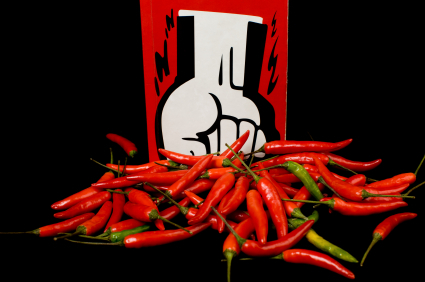 While it may not be easy to shake a cold, a bit of capsaicin certainly can’t hurt. 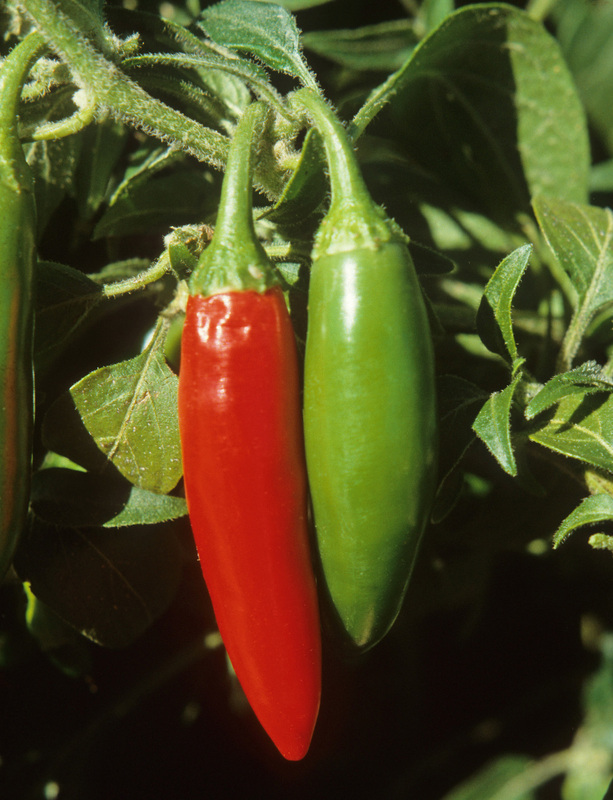 Chile peppers have been used for centuries in remedies designed to help conquer the common cold. Dr. Irwin Ziment, a pulmonary specialist at the University of California Los Angeles, explained in the March 1992 issue of Health Magazine about the similarities of spicy remedies to modern cold medicines. According to Ziment, “they trigger a sudden release of a wave of watery fluids in the mouth, throat and lungs. This helpful action actually begins in the mouth, throat, and stomach, where special sensory receptors send nerve impulses racing to the brain, which in turn tell glands lining the airways to start producing. Their secretions, like the chemical cystine, also helps thin down the respiratory mucus, so it’s easier to cough up and expel.” Basically, said Ziment, peppers act as an expectorant. And how about that hacking cough your neighbors turned you in to the authorities about? “You’d be better off with hot salsa than menthol cough drops,” councils Dr. Ziment. “Menthol cough drops not only dry out your throat, but paralyze the cilia–the tiny hair-like projections all along the airways.” So it seems pretty obvious; what we need are cough drops that come in red or green– chile flavors–that is. And we found that capsaicin-laced lozenges do indeed exist. We discovered Lofthouse’s Fisherman’s Friend Extra Strong Lozenges, which list as an ingredient capsicum tincture. They’re not super-hot, but you can detect some heat. And they’re sugar free. For a sore throat, some doctors prescribe a capsaicin-based throat spray which not only kills the pain but acts as an antiseptic. While very few doctors trained in traditional Western medicinal therapies prescribe chile peppers first in their treatments, many people are convinced of the healing powers of peppers. Geologist Dr. J. Michael Queen is one of them. Queen, who specializes in caves, has used cayenne to treat a host of ailments since he was four years old. As a child he was severely asthmatic. His condition was so serious that his parents had two choices; put him into the hospital full-time, or move to a place with less pollen. They chose the latter and moved into a log cabin in the mountains east of Sonora, California. According to Queen, his family was introduced to cayenne by accident. Since there wasn’t a doctor close by, they came to rely on a Native American herbalist who lived across the road from their house. He said that “she would brew up remedies, and they would get better.” The herbalist used cayenne to treat cold sores, digestive problems, and skin problems. Since his early experience with capsaicin, Queen says he chooses herbal treatments when appropriate. He drinks his cayenne remedy as a cure for strep throat, and within a few hours the white spots in his throat start to go away. And he has had great luck chasing away pesky colds with his cayenne cold remedy and tonic. “I’m sold on the medicinal effects of chile,” says Queen. However, he does warn to start with small amounts of cayenne if you are not used to chile peppers; 1/8 of a teaspoon is a good start. And conversely, feel free to use more if you are used to eating lots of peppers. Various studies have shown that when capsaicin is applied to a spot on the body, it depletes a neurotransmitter called “substance P,” which relays pain signals from an injured site to the brain. Additionally, capsaicin increases DNA synthesis and the production of collagenase and prostaglandin, which can reduce both pain and inflammation. A folk remedy for relieving toothache requires soaking a piece of cotton in tincture of cayenne and placing it inside the tooth cavity. More recently, capsaicin-based creams are seeing great success in helping to combat pain. Daredevil Evil Knievel swears by it. And so do thousands of other folks who have suffered from diabetic neuropathy, arthritis, cold sores, shingles, post-surgical pain and pruritus, a chronic itching syndrome. For many of the afflicted, chile pepper-laced topical creams offer relief from what is many times profound pain. However, the treatment can actually add to the pain, initially. Creams such as Zostrix, ToppSation, Axsain, and Dr. D’s Cream burn when rubbed onto the skin, making the treated area flushed and warm. The “warming” effect can feel like a burning sensation to some people, and they discontinue the therapy. However, for many of those who can stick it out, there is noticeably less pain in the treated areas within a few days. “It takes about four or five days to build up the pain relieving effect,” said Rob McCaleb, an ethnobotanist and president and founder of the Herb Research Foundation in Boulder, Colorado. Regular exposure for that long, he said, will deplete the Substance P at a particular site. It should be noted that the general common-sense rules of handling chiles also apply to capsaicin creams. It may be best to wear gloves when applying the cream. Also, make sure you don’t touch your eyes, nose or any other place on your body that you may not want to burn. Jasmine DeLouise (not her real name) says that hands down, her bout with the shingles was the most painful experience of her life. At the age of thirty, her life was going well, but she was under a huge amount of stress at her job. Shingles, or Herpes zoster, is produced by the same virus that causes chicken pox. The virus remains dormant in the body’s nerve endings, and can surface in some individuals during times of extreme physical or emotional stress. These out breaks range in severity from a single patch of blistery, itchy skin, to an agonizing blistery rash that can cover one side of the body. “I thought is was just a rash, so I kept putting off going to the doctor,” she said. “But I had never had a painful rash, and it seemed to be growing, so my husband talked me in to making an appointment.” DeLouise said that the doctor diagnosed her shingles within a few seconds of seeing the rash. While he mentioned that there might be some pain while she took her medicine and began to heal, she was unfortunately not aware of the amount of pain that would come. As the week went on, she said the pain got a little better, but the thing that made the biggest difference was when she used a capsaicin-based cream on the affected area. “A friend who had lived through the shingles suggested I give Dr. D’s Hot Pepper Formula a try. It burned at first, but in about a day, the pain from shingles was noticeably reduced.” DeLouise credits the cream and early identification of the rash to her relatively quick recovery. Many shingle sufferers struggle with the pain for months, and sometimes years. For more than thirty years, Dorothy Tracy has suffered from rheumatoid arthritis. According to Tracy, her pain is especially severe in her ankles, knees, elbows, and back. “It makes getting around, and really doing anything very difficult,” she says. On January 16th of this year, Tracy, a resident of Manitowoc, Wisconsin, decided to participate in the Natural Oven Bakery Program. Through the program, she agreed to take cayenne capsules twice a day, and attempt to alter her diet as much as possible to the suggested foods. Although capsaicin-based creams may make you feel much better and improve your mobility, Arthritis experts warn that you should be careful not to overextend areas that were previously less mobile. Capsaicin can stimulate the body without the side effects of synthetic drugs. According to Dr. John R. Christopher in his book, Capsicum, when ingested, capsaicin equalizes circulation, reducing blood flow where it is too heavy and increasing it where diminished, without increasing the heart rate. This equalizing effect is the reason that a teaspoon of cayenne mixed in a glass of water is effective for stopping a nosebleed, and the same remedy has also stabilized lung and uterine hemorrhages as well as other types of internal bleeding. It has been useful in healing bruises (applied topically or taken internally) and varicose veins, and has reportedly played an instrumental part in re-establishing circulation to limbs affected by frostbite and diabetes. While some people sprinkle a little cayenne powder inside their shoes to keep their feet warm, an internal dose will bring warmth and circulation to feet as well as to hands that are chronically cold. Robin Dipasquale, who is in the final months of her study and training at Bastyr University in Seattle, a post-graduate four-year degree program for naturopathic physicians, cautions that cold hands and feet could also be a sign of hypothyroidism, so it is important to pay attention to symptoms and check with a doctor. In a beautifully ironic twist for a natural chemical falsely accused of causing stomach cancer, capsaicin has been shown to be “absolutely effective” in alleviating the pain from oral stomatitis, mouth sores caused by cancer chemotherapy and radiation treatments, according to Dr. Ann M. Berger of Yale University’s Pain Management Center. The painful sores “can be overwhelming to the point that some people can’t eat and have to stop the treatment,” Dr. Berger noted. While there is certainly a plethora of scientific studies to back up the many stories of the healing powers of peppers, much more research will have to be done before doctors prescribe it as a “first therapy,” rather than the usual last-ditch effort. But don’t fret. Medical researchers are definitely interested in the Great Pod. And chances are they’ll discover even more uses for the chile pepper. Other countries lacked the benefit of chile until the fifteenth century when Columbus took it back to Europe from the Americas. Through the spice trade it spread around the world, and various cultures have since discovered the health benefits for themselves. In Indonesia, it is used for scabies, pimples, stomach ache, loss of appetite and low blood pressure. In India, it is used externally in paste form to treat tonsillitis, diphtheria and snake bite. A plaster mixture is applied to ease chronic lumbago, and the application of milk steeped with the whole chile plant reduces swellings and hardened tumors. In lozenge form it is used for sore throats and hoarseness. A tincture, “10 to 15 drops in a cup of hot beef tea,” calms the stomach and increases appetite, particularly for alcoholics, whose digestive powers are too weak to absorb food or medicine. Continued use has helped reduce the desire for alcohol, and chile combined with cinnamon and sugar has helped to calm delirium tremens. The tincture has also been used to treat diarrhea and dysentery, as well as malaria and disorders of the liver and spleen. The fumes from roasting chiles on cowdung are believed to help scabies. The Russians use nastoyka–one or two pods in a bottle of Vodka– as an appetizer, and for treating colds, rheumatism and stomach distress. Nastoyka is also mixed with other compounds and used as a liniment. Melissa T. Stock and Kellye Hunter are former editors of Chile Pepper magazine. This article was nominated for a 1996 James Beard journalism award for magazine series writing on health and nutrition. Together with Dave DeWitt, they published The Healing Powers of Peppers. Graham, D., et al. “Spicy Food and the Stomach: Evaluation by Videoendoscopy.” Digestive Disease Section. Veterans Administration Medical Center and the Baylor College of Medicine, Houston. Journal of the American Medical Association. 1988; 260:3473-3475. Kawada et al. “Effects of Capsaicin on Lipid Metabolism in Rats Fed High Fat Diet,” American Institute of Nutrition, 1986; 1272-1278. Lacroix, J.S., et al. “Improvement of Symptoms of Non-Allergic Chronic Rhinitis by Local Treatment with Capsaicin.” Clinic of Otorhinolaryngology, University Cantonal Hospital, Geneva, Switzerland. Clin. Exp. Allergy. September 1991, 21(5); 595- 600. Matucci-Cerinic, M., et al. “Effects of Capsaicin on the Metabolism of Rheumatoid Arthritis Synoviocytes in Vitro.” Comment in: Ann. Rheum. Dis. 49(8):653, August, 1990. Institute for Clinical Medicine IV, University of Florence, Italy. Mowrey, Daniel B. Proven Herbal Blends. New Canaan, CT: Keats Publishing, Inc, 1986. Sicuteri, F., et al. “Substance P Theory: A Unique Focus on the Painful and Painless Phenomena of Cluster Headache,” Headache, Jan. 1990; 30(2):69-79. Takeuchi, K., et al. “Gastric Motility Changes in Capsaicin- induced Cytoprotection in the Rat.” Kyoto Pharmaceutical University, Jpn. J. Pharmacol. 1991; 55:147-155. Visudhiphan, S. et al. “The Relationship Between High Fibrinolytic Activity and Daily Capsicum Ingestion in Thais.” Hematology Division. Department of Medicine, Faculty of Medicine Siriraj Hospital, Mahidol University, Bangkok 7, Thailand. The American Journal of Clinical Nutrition 35,: June 1982, 1452-1458. Natural Ovens of Manitowoc, 4300 CR Country Rd., P.O. Box 730, Manitowoc, Wis., 54221-0730, (414) 758-2500. The Healing Powers of Hot Peppers: Part 1, Cayenne as a Curative The Healing Powers of Hot Peppers: Part 3, Chile for Your Head The Powerful Health Punch of the Mighty Pod Spicy Food Off the Hook as Ulcer Cause–But Is It a Cure?